When it comes to share information via digital document in most secured and easiest way, the only best choice may be the PDF format. With end to end encryption, PDF format provides a high-end security for the data and allows the user to encrypt their files and documents with flexibility. However, when the PDF document containing vital information is accidentally deleted, you need to know how to recover deleted PDF file. PDF is the easiest mode for transferring data in compact file size. People can share maximum information in one PDF file without any hesitation, supported multiple content including images, text, vector graphics, videos, animations, audio files, 3D models, interactive fields, hyperlinks or even buttons. PDF file holds the maximum graphic integrity despise of the software, operating system or device. It will display the same content without any change or amendment. The convenience of saving file in PDF format is another reason. Once you complete the composition of desired content with Office suits or other utilities, you can use Microsoft Print to PDF feature to save it in PDF format with several clicks. There are also built-in feature and similar tools for Mac. 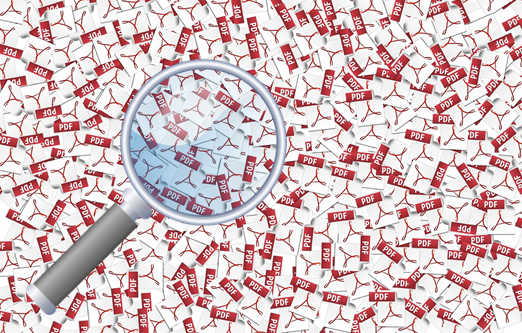 What if one loses important PDF files by accident? Many people have faced a situation when they lost valuable PDF document that was important for the time. The cost of time and money would be huge if losing the document permanently. How can we recover deleted PDF file? a matter of fact, when a file is deleted from storage device, it is not erased permanently. The reference linked to that file is removed, but the vacancy of the deleted PDF file is still waiting for new data, which makes it possible to undelete PDF files from Windows/Mac with the help of PDF recovery software if people do it fast enough. One of the potential software available for this purpose is iReparo File Recovery, which is able to recover deleted PDF files no matter they were created through Adobe or other PDF tools in Windows and Mac computer. 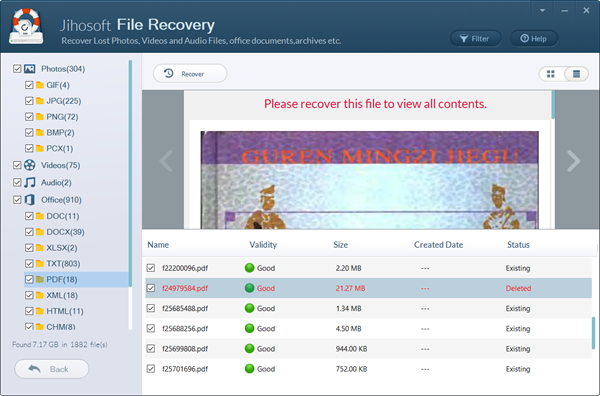 In addition to PDF file recovery, this recovery tool can also restore the following files. Document: DOC/DOCX, XLS/XLSX, PPT/PPTX, TXT, XML, HTML, WPS, PST, CSV, CHM, etc. Photo: GIF, JPG, PNG, PSD, ICO, ICNS, TIFF, PCX, RAW (digital camera images), AI, etc. Video: 3GP, AVI, FLV, MOV, MP4, M4V, MPEG, MKV, RMVB, TS, WMV, RIFF, MPG, SWF, MXF, RM, etc. Audio: MP3, WMA, WAV, MOD, RA, CD, MD, SF, AAC, VQF, FLAC, APE, MID, OGG, M4A, ACC+, etc. More files: ZIP, RAR, 7Z, ISO, TAR, GZIP, CAB, ARJ, LZH, ACE, GZ, UUE, BZ2, JAR, etc. The algorithm associated with this PDF recovery software makes an extensive search for the corrupted, deleted or lost PDF files and retrieve them for usage. It works on the principle of scanning PC’s hard drive, external hard drive, USB flash drive, memory card, or any other storage device, then allowing users to recover found PDF files. Step 1. Free download the PDF recovery software on your computer, then follow the setup wizard to install it. Step 2. Now run the program and choose Recover File on the first screen. Step 3. Select the partition where the PDF file was lost. Step 4. Click Advance Scan, then choose PDF format for recovery and click Scan Now. Step 5. Once the scan is complete, preview the found PDF files that were lost. Step 6. Select the PDF files you need, then click Recover button to get them out. You’ll be asked to choose a location for saving the PDF files. 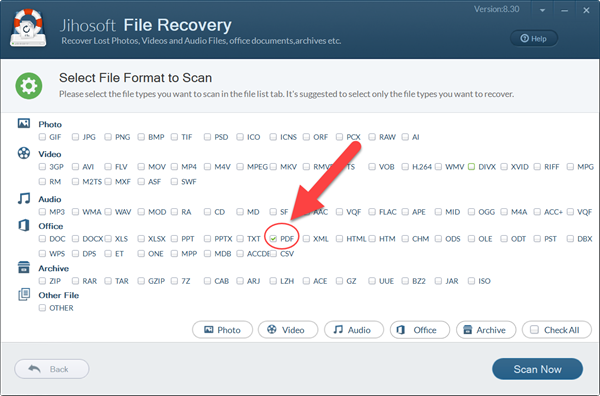 After the PDF file recovery is finished, you can open the output folder to check the recovered PDF files. Occasionally, you would find PDF files corrupted and unreadable, which could be caused due to partially overwriting after deletion or other reasons. In this case, you may try some free tools to repair corrupted or broken PDF file. There are a lot of free PDF repairing tools available for downloading or online using. Due to various cases of PDF file corruption, it is hard to say which repair tool is the best. Therefore, you have to try by yourself. Share your experience with us and get suggestion now!